What types of books do you reread? Picture books, novels, poetry books, your own journal, board books (every mom or dad of a 1-2 year old is raising their hand). Why do you reread a book? A 2012 study found that "re-consuming is therapeutic and should be encouraged." (livescience). According to the Daily Mail the same study also found that, "the second time through, the repeated experience reignites the emotions caused by the book, and allows people to savor those emotions at leisure." I love rereading picture books. I read with more expression and emotion when I know the story and text. I develop a stronger connection with characters. I notice more details in the illustrations uncovering more of the story. Every year I pull out the books we own by the authors whose birthdays we have celebrated in the past and display them on a bookshelf in our living room. My children choose from these books for before bedtime reading. Rereading their favorite books each year is one of my favorite things about celebrating author and illustrator birthdays. 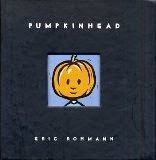 We have been rereading books by Eric Rohmann ever since we celebrated his birthday back in 2011. 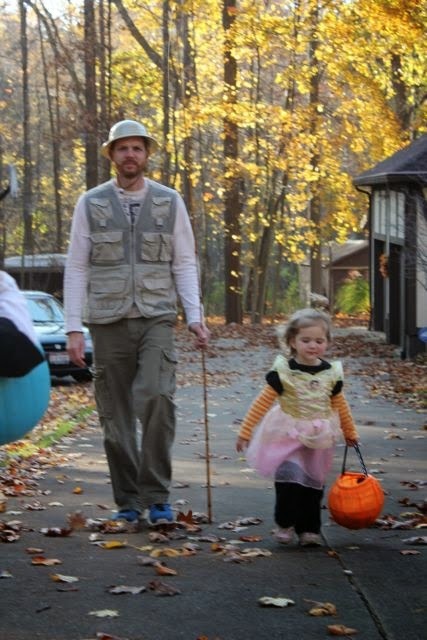 Our favorite books are Bone Dog, Clara and Asha, and Pumpkinhead. 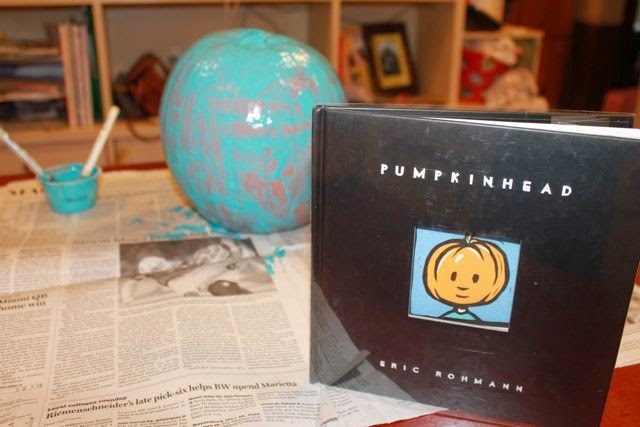 Pumpkinhead was the book that inspired our birthday celebration activity for Eric Rohmann three year ago. 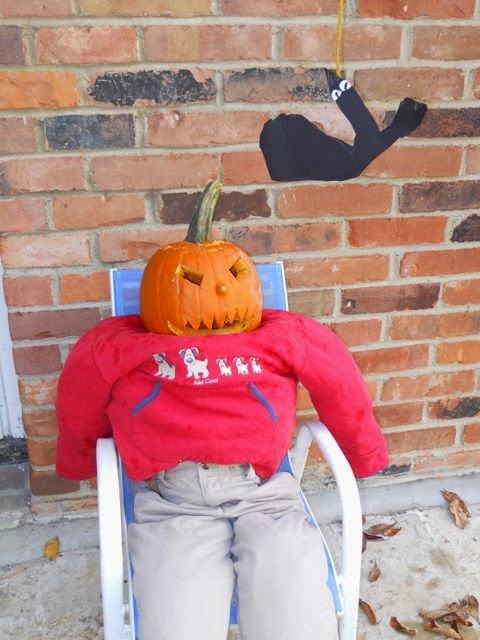 My oldest son and I made Otho, a boy born with a pumpkin for head, out of jack o'lantern, leaves, and some old clothes. This year, we read the same book and did the same activity, but rereading the book this year was different. The story even took on a very different meaning. Otho has pumpkin for a head. He has had it since he was born. His parents love him just the same and Otho is happy. However, life isn't easy for a boy with a pumpkin head. 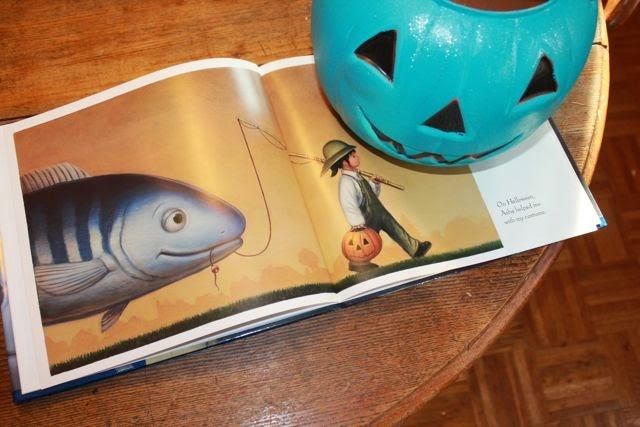 A bat takes his pumpkin head and drops it in the ocean where it is swallowed by a fish. 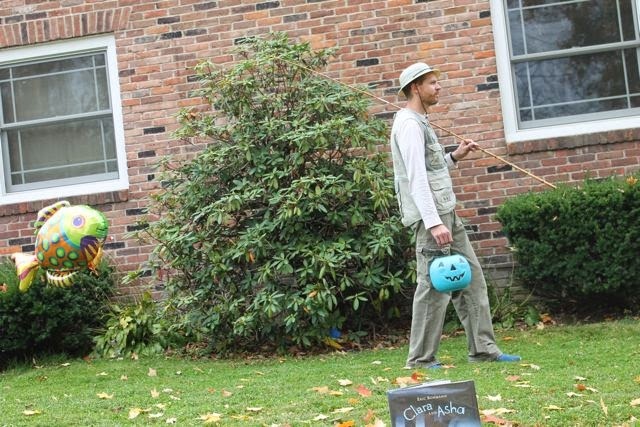 A fisherman catches Otho's pumpkin head and sells it the market. Luckily, Otho's mother shops for fish and sees the familiar pumpkin head. Her purchase later reunites Otho with his family. Otho's mother is happy to have him home but tells him, "You know the world will always be difficult for a boy with a pumpkin for a head." Quite a serious thought for a boy. But, Otho is happy and takes it in stride. He is okay with having a pumpkin for a head. He has had it since he was born. My youngest son wasn't born with a pumpkin for a head, but he was born with a life-threatening tree nut allergy. As a baby he exhibited symptoms that caused my wife to severely change her diet. We narrowed it down to a possible milk allergy which he later grew out of. However, one day when he was about two years old I was eating cashews and he asked to try one. Not thinking anything of it I gave him one. He put it in his mouth, didn't even bite it, and spit it out in my hand. Within two hours he was vomiting, swelling, and covered with hives. We rushed him to the emergency room and thankfully he was okay. Since that day, we have learned that he is also allergic to pistachios, walnuts, and pecans. A bat will not be taking my son's head and dropping it into an ocean, but every day there is danger that he could come in contact with a tree nut. We are very open, we have to be, with our son, "you know the world will always be difficult for a boy with a tree nut allergy." Quite a serious thought for a little boy. We have epi-pens stashed everywhere, food labels are checked and rechecked, and every one that comes in contact with him are aware of his allergy. How does he handle it? He is okay with a having a tree nut allergy (as long as he is assured he is safe). He has had it since he was born. 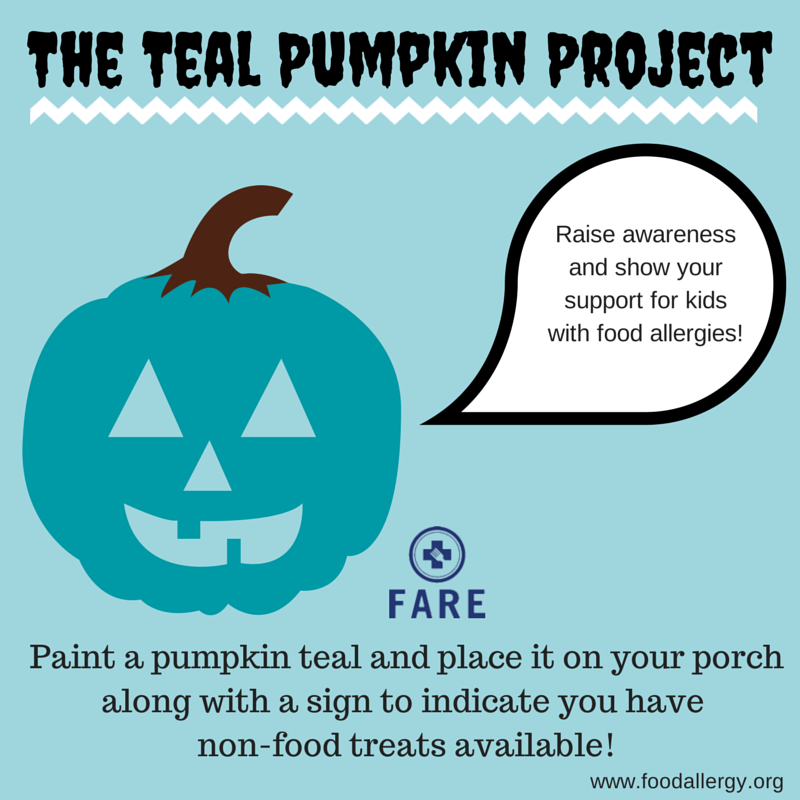 This year, Food Allergy Research and Education (FARE) started the Teal Pumpkin Project to increase awareness of food allergies during the Halloween season. 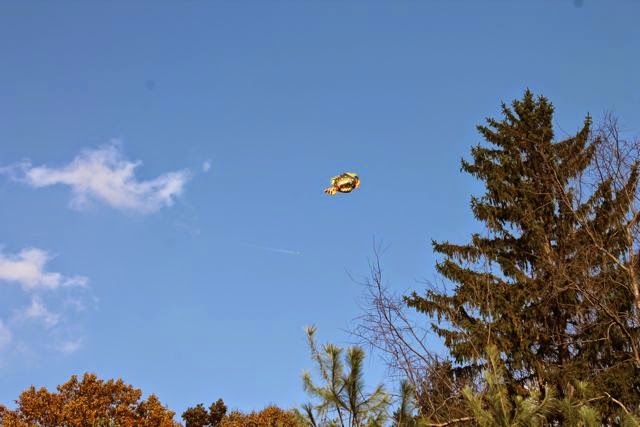 The project encourages homes to have non-food treats available for children with food allergies so they can feel included in the trick-or-treat events in their neighborhood. This year, I thought we could reread Pumpkinhead, make Otho, and help spread the word about the Teal Pumpkin Project. 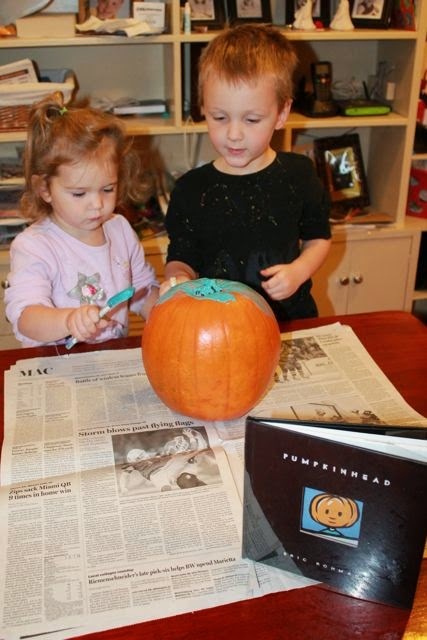 We chose one of our smallest pumpkins and painted it with teal acrylic paint. When the first coat was drying we started working on Otho. We found some old clothes in the basement and stuffed the arms and legs with towels (this worked much better than the leaves we used in 2011). 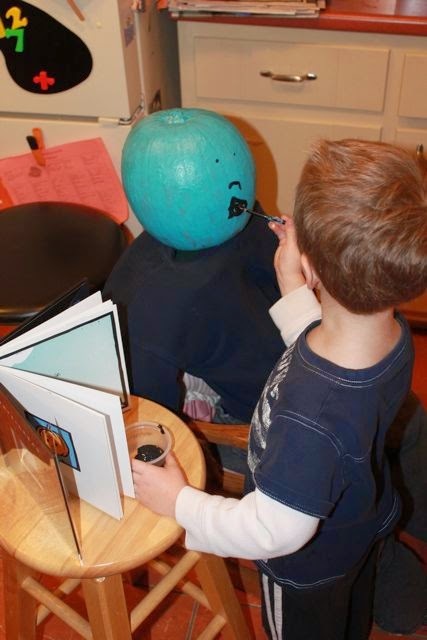 We also inserted a small pedestal inside the sweatshirt for the pumpkin head to sit on. A second coat was applied. We added some glittery teal paint too! 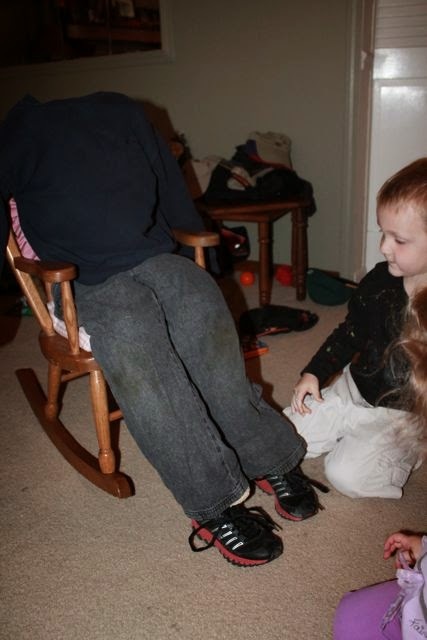 We let the pumpkin head dry over night and then my son added Otho's face in the morning with black paint. 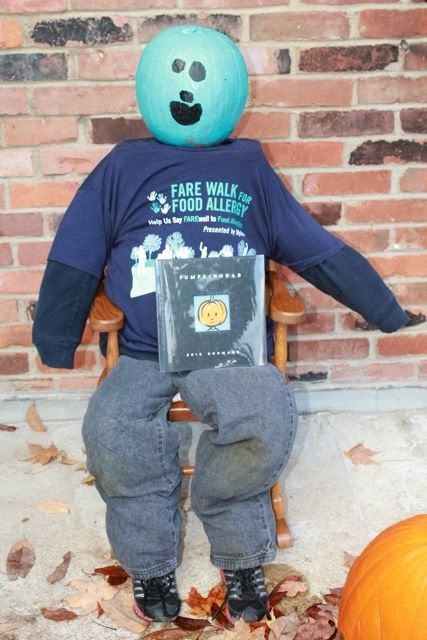 Otho is sitting on our porch in a t-shirt we received at a FARE walk over the summer. 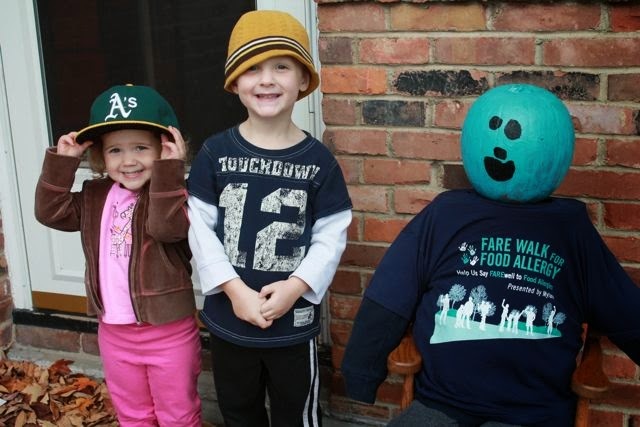 Will you provide non-food items at your home this year for trick or treat? Visit the FARE website for more information. Three years ago when I first read Clara and Asha I feel in love with an illustration in the story. Clara is a little girl who isn't sleepy. Opening her bedroom window invites Asha, a giant fish. They have been friends for some time after meeting one day in the park. They enjoy playing together. On this night, Clara and Asha play in the sky. It is really hard for a girl with such an imagination to fall asleep at night. This is the illustration I fell in love with. The text states, " On Halloween, Asha helped me with my costume." 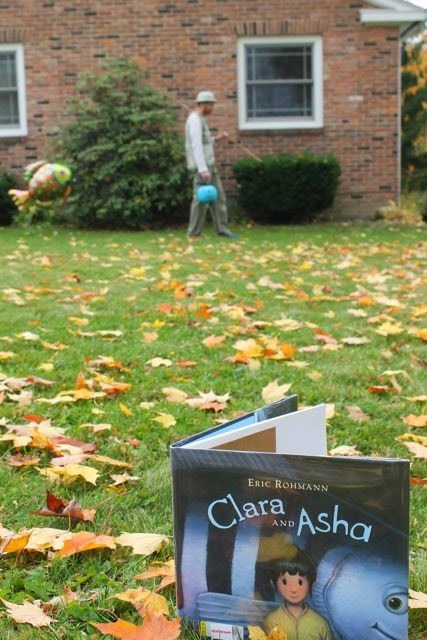 Every time I reread Clara and Asha I wondered if Clara and Asha could help me with MY halloween costume. I bought a large mylar balloon at my local grocery store. (They were nice enough to order it in special for me.) I attached the fish to a bamboo fishing pole and weighted it properly with pennies taped to its underside so the fish wouldn't fly too high in the air. 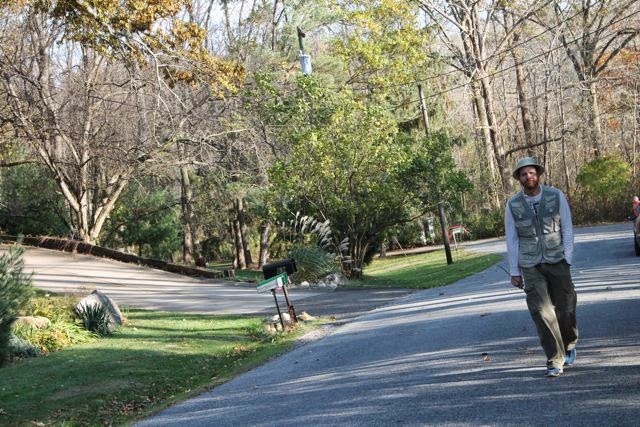 I put on a fishing vest and hat that I have saved for three years too! I became Clara and Asha went for a walk with me. We walked around the front yard looking at all the yellow and orange leaves. I have a teal pumpkin! My son will be using this one to trick or treat. 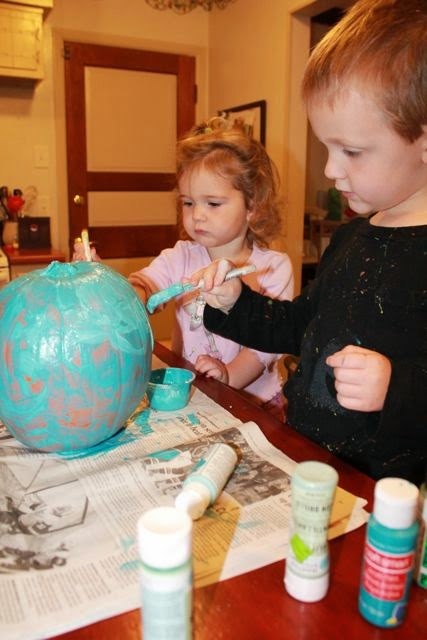 I think they sell teal trick-or-treat pumpkins, but we painted this one. I took Asha trick-or-treating at my niece's house. We goofed around by a lake near their house. Then, a big gust of wind came and Asha was gone. 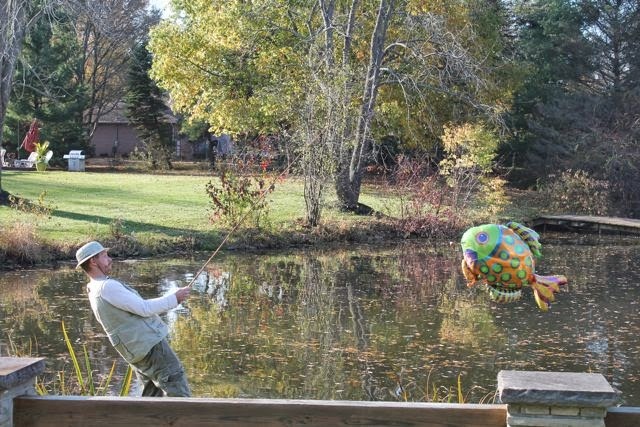 I was sad thinking I could have attached Asha better to the fishing line. 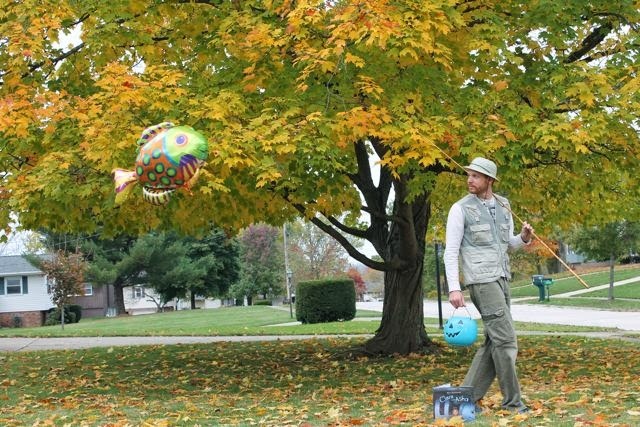 A dad without his fish but happy to be with his children trick or treating. I guess that study was right. Rereading books can "reignite emotion". I spent the week really thinking about food allergies and the stress they put on families during events that involve food. Each time I went to a house with my son I was reminded of his allergy as we tried to find a safe treat in the bowl. And Asha. 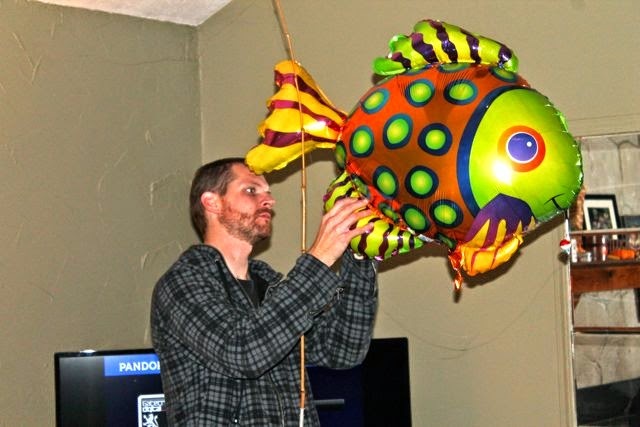 My children told me they were sad that the fish balloon floated away. "You can always buy another one dad," they told me. I said, "You are right. I could always buy another one."